The Mount Washington Cog Railway is a historic railway that climbs to the summit of New Hampshire’s Mt. Washington, New England’s highest peak. Guest begin their journey by boarding the train at the Marshfield Base Station, located at an elevation of 2,700 feet. The historic train station is home to the railway museum, a gift shop and restaurant. The museum features a presentation on the History of the Cog, as well as exhibits and displays on the history of the railway and Mt. Washington itself. The Cog Railway is home to 16 locomotives, eight of which are stored on display either at the Marshfield Station or in neighboring New Hampshire towns. Peppersass, originally named Hero, was the first of the Cog Locomotives, built in 1866. Peppersass ran through 1929, and today is parked at the Marshfield Base Station. One classic steam engine, Waumbek, continues to makes the trip to the summit and is usually first to depart each day. Waumbek was built in 1908 by Manchester Locomotive Works. The Cog Railway also has six newer and more efficient biodiesel engines, which pull classic passenger cars up the mountain. Following tradition, each of these new biodiesel engines were designed and built at the railway shop. Trains run up and down the 3-mile climb on a rack and pinion system involving cogs, or toothed wheels, which prevent roll back as the engines climb the tracks. Referred to as the ‘greatest wonder of all time,’ on opening day in 1868, the Cog Railway was designated a National Historic Engineering Landmark in 1976. A GPS tracking system allows for an audio tour aboard each train to be synced with the train’s location along the track. At the summit of Mt. Washington, visitors have time to visit the Observatory as well as the Tip-Top House. At the Observatory, the Extreme Mount Washington exhibit allows guests to experience the summit’s winter weather year round through a series of interactive displays. Mt. Washington is known as ‘Home of the World’s Worst Weather’ and conditions can be as extreme as those of the Polar Regions. The Tip-Top House is a historic former hotel at the summit, which now operates as a small museum. The building, made of three-foot thick stone walls, is on the National Register of Historic Places and is thought to be the world’s oldest standing example of summit hostelry. The building was completed in 1853. If the skies are clear, views from the summit of Mt. Washington extend far beyond the White Mountains National Forest to the Atlantic Ocean. History: The Cog Railway was the dream of New Hampshire inventor Sylvester Marsh who began planning the railway system in 1852. After being laughed away by the New Hampshire State Legislature for his ‘insane’ idea, Marsh contributed $5,000 of his own money and gathered additional investors to begin the project on his own. The difficult task of building the train rails took years, and it wasn’t until 1862 that Old Peppersass, the first Cog locomotive reached Mt. Washington’s summit. In 1941, a switch was added allowing trains to pass each other, making more trips to the summit available each day. For almost 20 years the railway was run by Ellen Crawford Teague, the first woman railway president in the United States. In 1986 the railway was purchased by the Bedor and Pressby families, who immediately went to work restoring the locomotives and tracks. The biodiesel locomotives were introduced in 2008 in an effort to be more environmentally friendly and avoid the ‘Cog Smog’ that’s emitted from the steam engines. The railway has been continuously operating under private ownership for close to 150 years. Ongoing Programs and Education: Annual events at the Cog Railway include Railway to the Moon, a Steam Punk themed festival. Each Thanksgiving weekend in November, Santa and Mrs. Claus ride the Cog Railway for a special guided tour. Hot chocolate and cookies, as well as games and activities take place at the base station before or after each ride. 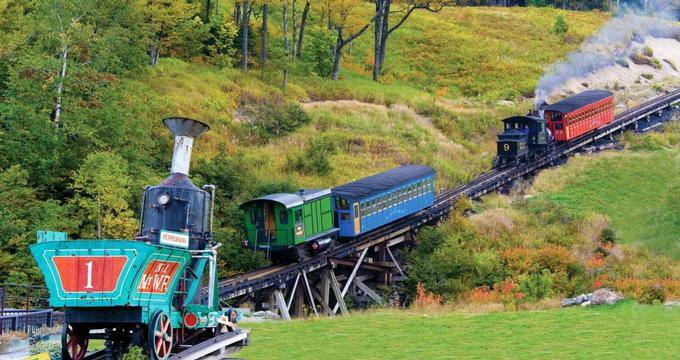 A three-year series of special programs and events has kicked off which will culminate in the celebration of the 150th anniversary of the Cog Railway in the summer of 2019. Group tours area available for groups of 20 or more. Educational tours are popular for groups with interests in history, environmentally friendly design or the weather systems at the summit of Mt. Washington.